In the U.S., buying a refurbished handset isn't much of an issue. In India, however, Apple has to apply to import these previously used handsets into the country to sell. And Apple's application was flat out rejected. The same thing happened last year when the environment ministry turned Apple away. The company's goal is to sell lower priced handsets in what is the second largest mobile market in the world. Apple has just 2% of the Indian smartphone market, and with the possibility that we have seen a short-term peak in iPhone sales during the calendar fourth quarter of 2015 (when 74.8 million units moved), selling refurbed iPhones in India could provide Apple with some incremental sales that could bolster Apple's top and bottom line, while smoothing out the decline in the product's sales. 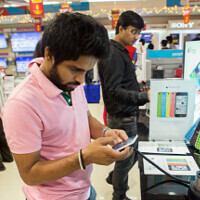 Apple is also looking to open retail stores in India to help it compete with some of the local handset providers. But all of these plans are now in limbo following the rejection of Apple's application. Other handset manufacturers in India went public with their plea that the government prevent the used iPhone models from being offered in the country. They claimed that it would lead to a flood of used electronics imported into India, while at the same time it would go against the Indian government's program that highlights goods that are "Made-In-India." Apple has decided not to comment on the rejection at this point in time. 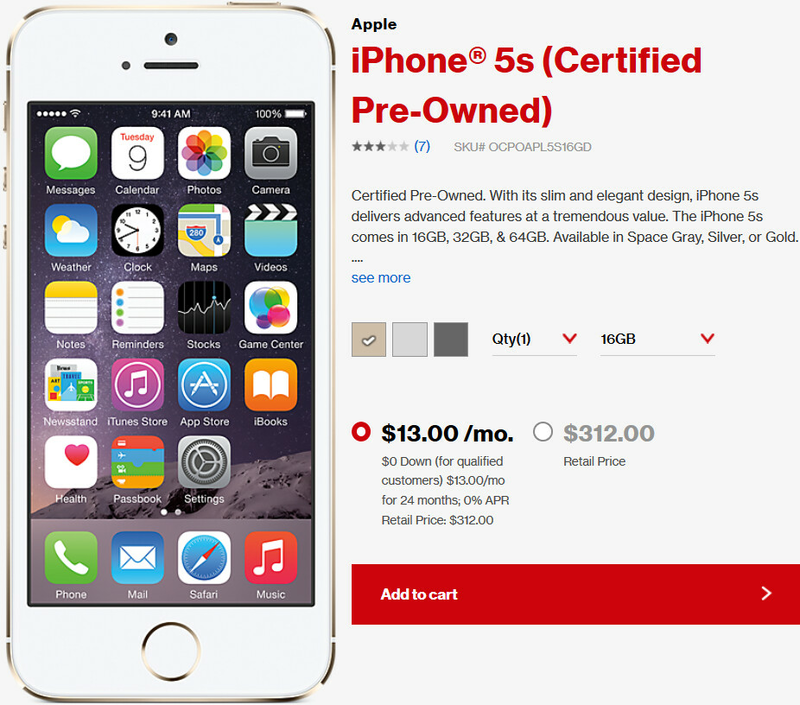 Refurbished iPhones, like this Apple iPhone 5s offered by Verizon, are quite common in the U.S.
Apple declined to comment b/c they're busy trying to figure out who they need to pay to get this accepted. Because the Made in India programs has worked so well with the Freedom 251.... "We don't want to sell your products but we will offer you tech support. Thank you, please come again." I think its an excellent decision made by India government. Who lives in India anyway???? Oh that's right. Like 1 billion people. In what world do u live? It was 1.2 in 2011. But what exactly you wanted to say through this comment? I'm sorry but why do people think it's such a good thing that Apple can't do this? Re-using is more economical than recycling and people in Europe, America and Australia aren't going to buy them. Apple is trying to dump all of their old garbage into India and they don't want that. How about Apple sell new stuff for more reasonable prices? Apple is the greediest and slimiest company on the planet. isn't the consumers choice whether they want new or used? people buy used cars in India all the time. Let the consumers make the decision not some overreaching government. Are those cars made in India? It's not about them refurbished right? It because they are being furnished by outsiders. You claim is lame because if the car was once new and it never left the country, then it's not the same as a car company importing uses certified pre-owned cars into the country. It's that simple and you missed it. B3cause using old hardware keeps the country on a technically lower level vs the US for example. These other countries need to move forward and catch up on the tech world and selling used garbage is not the answer. Apple could simply make an iPhone like Samsung John series. It could simply be a iPhone 5 inside a new case design as an alternative. Then they could sell it no problem. After all, they are practiced at sell regurgitated products in a repeat design. Are those phone all refurbished? Because I'm betting are plenty new ones that never sold in the first place. On a lower level? Are you retarded? It's because it will drive down sales of their own locally produced crappy handsets that people only buy because there's no other compelling alternative. I'd say Apple should be allowed to sell...and people be able to decide...if they want to buy used devices or not. Ask them to sell junk from all over the world in your country. We already have huge e-waste to deal with. Its better that they are not allowed to add more. Very Poor article done with absolutely no research and finding what was Rejected. What APPLE wanted to sell is a) Import Refurbished phones from US/UK/EU and all over the world and sell it in India. b) Could not guarantee any Warranty or support. c) Wanted the Indian Govt to change its law which it has applies for all Imported Electronic goods They can still import "NEW" phones and sell them in India. If any "NEW" iphones are dysfunctional during the warranty period, they can provide a repair/replacement phone which can be a refurbished one. All they cannot do is to "IMPORT REFURBISHED PHONES and SELL IT TO THE LOCAL MARKET". If atleast they had promised a WARRANTY they have legs to stand on. So they just asked for permission to DUMP their goods. For all those Yahoos commenting on Apple Quality etc etc and how the free market works blah!blah! blah!. They can very much sell this phone cheap in the US/WEST/EU in EBay/Livingsocial/AFL. After all do we not have 1000s of sites that sell refurbished phones? Will they be Ok in importing Refurbished phones from China rather than importing a new one. If so Apple can use that model in the west. LOL! Thank you for showing us the facts. I read the source and I concur with the assessment of what happened Many just make assumptions on poor jounalism. It's seems since this was PA's beloved Apple, they would have tried to give more info, instead of making it look like India was blocking Apple for no reason. While most idiots come here to read post and star flame wars, most never read the source links for details. Refurbished should only be for warranty replacements However I don't have an issue with US carriers selling them at a discount.but I think used products should be sold 3rd party and not first party. Carriers really shouldn't sell them, but I see it as not being huge different from buying them on eBay. After all the carriers still has to activate it. But you get no warranty. When you get it from the carrier, the carriers provides its own warranty coverage which is equal to is a new phone stops working. They will.give you another refurbished. Apple tried to get over and India blocked it. Good move. I guess Apple will.need to take the 5S parts and make another 5C or a 6C and sell it in India. If Apple wants to sell it's products in developing countries, why doesn't it make an affordable product? It doesn't cares for people who have less money and then wants to sell old phones to them. It's questionable IMHO. You people dont understand global economics. India is a self sustaining country. By allowing importing competitors products at lower rates, would slowly begin to ruin their economy. This would create more competition to the manufacturing and sales within their own country. It's like shooting yourself in the foot and allowing yourself to bleed out. It has nothing to do with the fact that its an "iPhone"